The biggest game not named the Super Bowl is next week. And Pizza Hut is kicking off the pregame action with a special deal sure to make college football fans cheer. 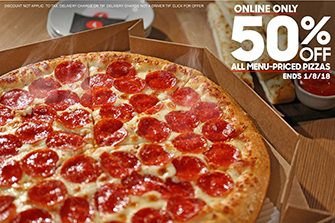 All menu-priced pizza orders placed online or through the Pizza Hut mobile app through Jan. 8 are 50 percent off. To easily enjoy Pizza Hut's 50 percent online offer, visit PizzaHut.com or download the Pizza Hut Mobile App for iPhone and Android and click the 50 percent off deal tile. The discount does not apply to other non-pizza menu items, tax, delivery charge, donations, gift cards or driver tip. "The holidays are over, but entertaining season is in full swing. And we're kicking off 2018 with a deal that helps slow the spending, but not the fun," said Zipporah Allen. Allen is Vice President of Marketing for Pizza Hut. "Tapping the Official Pizza of the NCAA for a college football championship party makes it easy to serve great-tasting pizza for an affordable price."